Northern Arizona University researchers are working across many different disciplines to tackle a range of energy-related issues using innovative technological approaches, including ecoinformatics to map carbon emissions and laser physics to cut energy consumption. An expert in ecological and environmental informatics, NAU professor Kevin Gurney’s research focuses on carbon cycle science, climate science and climate science policy. Several of his large-scale projects involve simulating the global carbon cycle by quantifying fossil fuel CO2—all the way from single buildings to the global scale; the relationships between U.S. energy demand/supply and climate change; the linkages between terrestrial carbon exchange and climate variability; and the impacts of deforestation on climate. The Vulcan Project, funded by NASA and the U.S. Department of Energy (DOE), employs ecoinformatics to quantify North American fossil fuel carbon dioxide (FFCO2) emissions at space and time scales much finer than has been achieved in the past. The technology developed by Gurney and his team helps scientists and others better understand and manage the energy-related emissions of this most important greenhouse gas, critical to improving scientific understanding of the carbon cycle and as a result, climate policy. “The detail and scope of the Vulcan FFCO2 inventory has made it a valuable tool for scientists, industry, policymakers, and the public at large,” said Gurney. First released in 2002, a new version of Vulcan is scheduled for release in mid-2019, improving input data and methods used as well as extending the estimation time period to 2010-15. Among the improvements are the addition of more detailed data on buildings and vehicular traffic. The Hestia Project™ builds on Vulcan, but provides even more detail, quantifying all FFCO2 emissions in individual cities down to the scale of buildings, streets and factories. With cities accounting for roughly 70 percent of FFCO2 emissions, the Hestia Project targets those locations where climate policy is most effective. 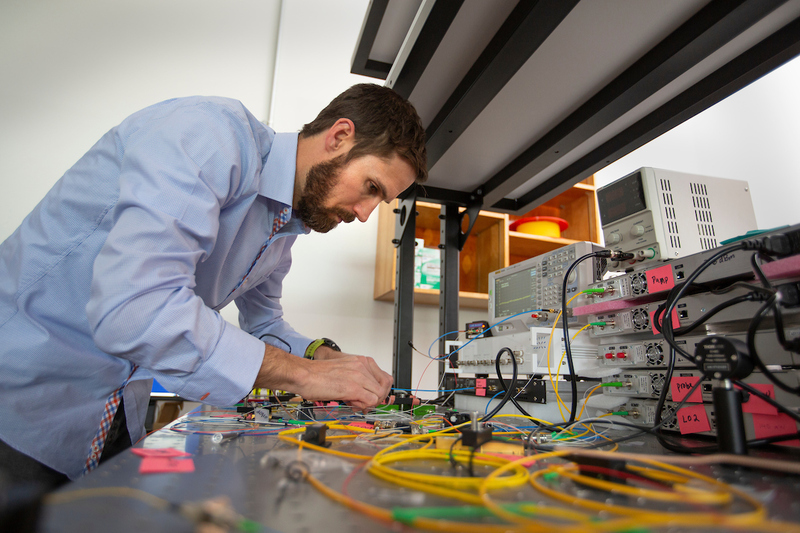 NAU assistant professor Ryan Behunin explores fundamental questions regarding the interaction of light, sound, and matter—from quantum friction to laser noise, with Brillouin physics as his primary focus. NAU assistant professor Ryan Behunin has been working on project to cut data center energy consumption. Behunin recently joined a major new study funded by the DOE’s Advanced Research Projects Agency-Energy. The multimillion dollar, three-year project, “FRESCO: FREquency Stabilized Coherent Optical Low-Energy WDM DC Interconnects,” is a collaboration between the University of California, Santa Barbara, Yale, Stanford, NAU and the National Institute of Standards and Technology (NIST). As data centers expand to handle the exponential growth of global data traffic, the amount of energy they consume is increasing at an alarming rate. Behunin will contribute his expertise in nonlinear dynamic laser modeling and physics to the project as the team develops the FRESCO transceiver, which will leverage recent advances in fundamental laser physics to enable terabit, coherent optical (light-based) data transmission inside data centers using an ultra-pure, ultra-stable laser signal. This low-power, low-cost solution will be able to overcome power and bandwidth scaling limitations of current technologies. The outcome of the project will be an integrated photonic package capable of connecting to 100 terabit-per-second networking switches over coherent optical short-reach data center fiber links. Using transformative technologies based on advanced laser physics, the project team believes FRESCO will disrupt the way data centers, data center interconnects and terabit Ethernet switches are engineered. The new solution is expected to significantly reduce global data center energy consumption—currently estimated at 10 percent of the world’s electricity production, and predicted to rise to 20 percent by 2025 if existing technologies are still in place. The project plan includes commercializing the technology developed in partnership with several industry partners, including Microsoft Optical Research, Barefoot Networks and Morton Photonics. Kerry Bennett is Northern Arizona University’s Research Communications Officer. Connect at nau.edu.